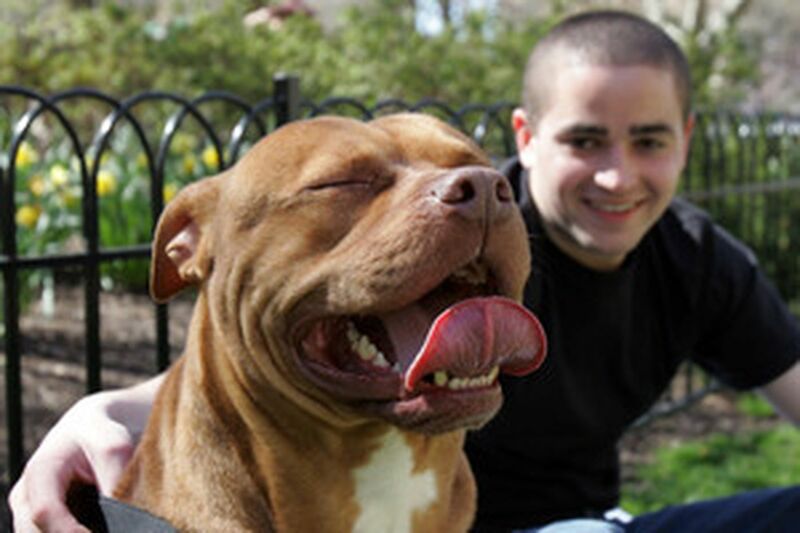 Kiko Galarza, 23, and his 2-year-old dog Ricardo enjoy the sunny day in Philadelphia. The region will play host to long-anticipated guests this weekend, a couple who couldn't possibly overstay their welcome: Sun and Warmth. If the forecast holds, today will be the first officially clear day in a month that already is the wettest April in Philadelphia since at least 1874, when records first were kept. With nine days to go, the 7.6 inches of rain measured at Philadelphia International Airport are barely two inches shy of the 1874 mark. Through Thursday, temperatures averaged below normal for 16 consecutive days. The warmest reading, 79, came way back on April 2. The gloom and chill are going to lift dramatically, with temperatures expected to reach well into the 70s through at least Tuesday. That has Sarah DePietro pumped, for two reasons. "We've had springwear in since the end of February and people did not want to try it on, not with this weather," the sales clerk at Ellie, a women's clothing boutique in Haddonfield, said yesterday. Reached by phone around 1:30 p.m., she said the store was "very busy" with moms and young children. "The good weather did bring everybody out," DePietro said. She expects the same for today. Tomorrow, she's taking off. However, it will not be to celebrate Earth Day, founded 38 years ago by the late Gaylord Nelson, then a U.S. senator from Wisconsin, to promote environmental policies. "I'm going to go to the Shore," DePietro said, to get her house in Ocean City ready for the rental season. It's also time to get the lawn and flower beds ready, nursery manager Danielle Goodson said yesterday as colleagues unloaded trailers packed with shade trees, evergreens, shrubs and flowering perennials at Holly Days garden center in Horsham Township. On the lawn, crabgrass prevention is in order; in the flower beds, weed prevention, Goodson said. "Then put your mulch down," she said, "and start planting." Yesterday, the only planting on Ken Foreman's mind was where to put his feet before teeing off. The Lower Gwynedd Township financial consultant was practicing his swing at the Lower State Road Driving Range, where nobody was waiting to use any of the 10 heated stalls. There was a line, however, at Duke's Firehouse Co., a car wash in Blue Bell. "You came at a bad day," one harried employee said as a reporter approached him about 10:30 a.m. With an Acura, a Jaguar, an Audi and an Expedition waiting to be wiped dry and nine other vehicles in line to be washed, he said he had no time to chat. But customer Tom Price did. Wearing shorts, a polo shirt, sandals and sunglasses, he was the picture of springtime indulgence. Once his Acura was ready, he was headed to nearby Cedarbrook Country Club for an afternoon on the links. The insurance executive said he gives his staff time off when there's ice and snow on the roads. He gives himself time off when the outdoors is as irresistible as it was yesterday. But today, the eight yards of mulch heaped on his driveway in Upper Gwynedd Township will rule his life. When he's done hauling and spreading it, he said, "I'll probably have a cold Miller Lite on the patio." It beats his previous weekend, when 4.19 inches of rain on Sunday set a record for that date and Price spent 31/2 hours "with a dry vac." Our take on the weather? Find out in our weather blog at http://go.philly.com/weatherornot.